The National Office of Drug Control Policy has identified a growing national concern regarding the increase use, misuse and abuse of prescription medications in the past five years. In 2013, the Royal Oak Community Coalition developed an innovative, out-of-the-box program to address this public health crisis. The Holistic Health and Wellness Expo is designed to connect local youth and families with complimentary and alternative healthcare approaches which help manage physical, mental, and emotional pain without having to rely on potentially addictive or harmful prescription drugs. 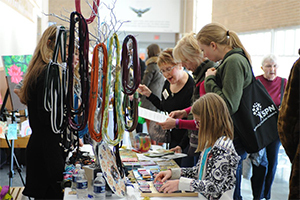 With sponsors including the Royal Oak School District, local prevention coalitions, and regional holistic providers, the Expo features a wide variety of holistic healthcare modalities known to reduce stress, pain, depression, and addictive behavior. After the Expo was first implemented, EMS runs for prescription and illegal drug overdose in Royal Oak has decreased significantly from 84 calls in 2013 to 52 in 2014. An examination of quantitative and qualitative data revealed this gap in Royal Oak's community health sector. As discussed above, data from Royal Oak's EMS activity served as the basis of our programming efforts. According to the National Center for Complementary and Integrative Medicine, there has been a 40% increase of adults using holistic modalities to address health-related issues in the past five years. Over 83 million Americans spent $33.9 billion in 2014 on visits to complementary and alternative practitioners and on purchases of products, classes and materials. Healthcare consumers cite a growing disinterest in relying on prescription drugs for managing health-related concerns. Integrative medical centers are rapidly developing in tertiary care settings. Holistic practitioners are forming professional associations, such as the Holistic Chamber of Commerce, to address growing public interest. County, city municipalities, and school districts are forming Health and Wellness committees. Indeed, insurance companies are beginning to extend coverage to evidence-based complementary and alternative modalities. The Coalition recruited ten committee members from related community associations and sister coalitions, including interested members of the public and two non-profit interns. The mission of the Expo is to introduce complementary and alternative healthcare approaches to local youth and families in a relaxed, safe setting, providing them with knowledge and resources in an effort to transform public discourse toward positive, sustainable healthcare approaches. 1. Empower attendees to be active participants in their healthcare consumption. - Provided space for established wellness professionals to engage with attendees through demonstrations and conversations. 2 . Deepen public understanding of healthcare practices that enhance wellness without pharmaceuticals. - Offered 27 practitioner-led presentations for active participation in mindful physical, mental, and emotional wellness practices. 3. Structure an environment for practitioners to cultivate relationships with attendees. - Provided ample working stations between booths for private discussion and for participations to experience therapeutic modalities first-hand. A ten-person committee and four sub-committees met regularly throughout the project development. The application package and practitioner/vendor selection criteria were updated from the previous Expo. Recruitment efforts resulted in 5 sponsorships, 72 practitioners and health product vendors, 40 student and adult volunteers, a photographer, video production and technology support, and donated give-aways for attendees. The Expo committee secured community involvement by partnering with city and school district wellness committees, helping and treatment agencies, a regional Holistic Chamber of Commerce, and local colleges. Extensive promotional efforts reached over 120 local and regional organizations, including social and traditional media outlets, radio, and local cable interviews. To assist attendees, the Expo committee created a contact list of practitioners and health product vendors, a reference guide defining the services featured therein, a list of web-based resources, and a scavenger hunt to engage teens in the Expo. The Expo committee also created magazine articles, newsletters, pamphlets, and related classes schedules. The Expo committee maintained meeting agendas and minutes incorporating a running "Lessons Learned" module to provide an ongoing reflection of actions taken, identified challenges, and the discovery of new opportunities. Practitioners were given three surveys to assess their pre-event, during-event, and post-event experiences and appraisal. Most reported gaining potential clients, appreciating the venue, and positive feelings about the response of the attendees. Attendees were given two surveys. The pre-event attendee survey ascertained the value of our six marketing and promotion strategies. The post-event attendee survey gathered information on the value of his or her experience at the Expo. Many attendees stated their intent to make appointments, take a class, or incorporate wellness practices in their daily life following their experience at the Expo. Two weeks after the event, the Expo committee held a debriefing meeting to share perspectives, review survey results, finalize lessons learned, and discuss plans for the next Expo in 2016. 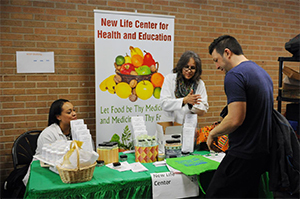 The growth of the financially self-sustaining Holistic Health and Wellness Expo indicates that the Royal Oak Community Coalition's platform is undeniably successful in connecting people with resources. Survey results indicate 97% of practitioners and 95% of visitors are interested in returning next year. Both indicated a desire for continued opportunities to share and access information. Plans for the 2016 Expo are underway, focusing on several ideas to strengthen the Expo's foundation such as applying for Continuation Education Credits for social workers and counselors, hosting Lunch and Learns with wellness committees, and sponsoring a practitioner-led series at our public library. The ROCC provides updates and information about the Expo on our website and newsletter reaching 8,000 organizations and families. By putting complementary and integrative health and physical, emotional, and mental health on community agendas, the ROCC pursues a crucial quest to encourage a shift in health care practices from passive to active participation and leadership. The first Holistic Health and Wellness Expo held in 2013 was met with considerable confusion. We spent a great amount of time and effort explaining and promoting the intentions of this event: to facilitate a language transformation in community prevention toward a focus on wellness, and to address the concerning increase of self-medication with empowering knowledge of natural healthcare approaches to support physical, mental, and emotional health. Attendance at the first Expo was a meager 150 participants and featured only 37 practitioners and health product vendors. Now in year three, the Expo no longer elicits confusion. In 2015, we gladly report that over 720 people came through the doors during the five hours. The 2015 Expo proudly featured a full capacity of 72 practitioners and vendors, with 40 unfortunately relegated to our waiting list due to the limited size of the facility. The Expo now receives overwhelmingly positive feedback from the community.